Many punters may find it difficult to oppose Manchester City ahead of the FA Cup final with Wigan, but the 1/5 offered for them to lift the trophy is hardly going to allow for a spending spree. However, the King Of Stats has attempted to dig up some more lucrative prices that could reap rewards. 3 – In the last 20 years, the FA Cup has only been lifted three times by the club to get changed in the away dressing room. This is not great news for Wigan, who can be backed at 10/3 to win the competition for the first time. 3 – Callum McManaman has scored in three successive FA Cup contests to help Wigan reach this final and also grabbed the important winner in the recent Premier League clash at West Brom. He is 6/1 to score at any time in the 90 minutes against Manchester City. 7 – Wigan have failed to score in all of their last seven encounters with Man City in all competitions, with the Citizens winning on each occasion. It is 17/20 that Man City keep a fifth clean sheet in their sixth FA Cup game this season and 11/10 that they win without conceding. 6 – All of the FA Cup finals to be played at the new Wembley Stadium have been settled by a margin of one goal. The price is 11/4 for Man City to come through by a single-goal margin like they did against Stoke in 2011, while a Wigan victory in the same manner is 10/1. 42 – The number of goals Man City have scored in the FA Cup under Roberto Mancini from 18 games, at an average of 2.33 in each match. In the Goal Crazy market, it is 1/1 that Man City score 2-3 goals past Wigan. 6 –Not since Kevin Moran in 1985 has a player been sent off during normal time in an FA Cup final, but this year’s referee Andre Marriner has dismissed six players in the last seven games that he has officiated. 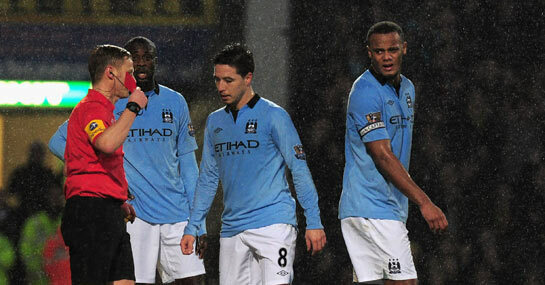 18/5 is the price for a red card this time and Man City and Wigan have accumulated five between them in the Premier League this season. 3 – Man City have scored in the 15-minute period between half-time and the hour mark in the last three rounds of the FA Cup, while Wigan have conceded in this time period in both of their Premier League games in May. This suggests 29/20 is a fair price of a goal between half-time and the 60th minute in the final for either side.